I fly fairly regularly – not enough for the perks of super-elite status, but enough to be bumped around through the maze of disappointing service that is Air Canada. Sometimes I’m surprised by a staff member who is helpful or friendly. Mostly it’s a mildly irritating experience at best. However, I’m tired of complaining about the airline as they don’t listen or seem to care. So, this will be my final gripe. After that, I’m resigned to accept that lacklustre service is part of the brand. But…on a recent visit to California, a couple of small things stood out as further examples of AC’s failure to communicate. The first happened at the Toronto airport when the airline ‘changed equipment’, we discovered we’d lost our seats and, like many others, were no longer guaranteed a place on the flight. I pleaded for clemency as I was part of a wedding party and would have missed the ceremony if they didn’t let us on. In the end, a kind young man stepped forward and offered his seat. But much of the angst might have been avoided with a quick email informing passengers of the situation, the potential SNAFU and our options – we know they have our email address. On the way home we were on-board and ordered snacks. 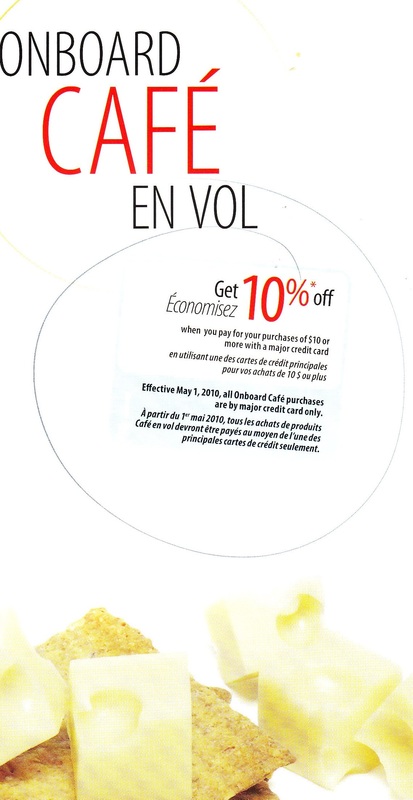 The menu advertised a 10 per cent discount on purchases over $10 in June and July. However, when I got my receipt, it was for the full amount. Now, we’re not talking a lot of money here, but when I mentioned this to the flight attendant, he said the machines must have been reprogrammed and wouldn’t allow the discount or a refund, but he could make up the difference in snacks. This seems like a case where the AC bean-counters turned a promise into something as worthless as a ‘hill of beans’ (that you could probably buy from them for $3). A little later, the FA said AC almost never informs staff when equipment is changed and they only find out when passengers grumble. Here’s a thought: how about spending a little more effort communicating with flight attendants and front-line reps; empowering them with information that they, in turn, could share with the passengers. Pretty basic stuff. I’m just glad to hear Virgin Airlines is now flying out of Toronto. Thanks to Klout, I get a chance to sample the service later in the month. From what I’ve heard, this will be a welcome change. I can’t wait. While I only fly a few times a year, more often than not I find myself on Air Canada and have witnessed firsthand their lack of communication and and consideration toward their passengers. This was brought to light further when I flew Porter for the first time last week. Checking in was quick and painless, and Porter offered its customers a clean lounge area, well-equipped with snacks that didn’t come out of a bag as well as computer stations, comfortable and plentiful seating, and a generally welcoming atmosphere. Air Canada passengers are only allowed this “privilege” if they are of an Elite status. Porter’s flight itself was comfortable, and its staff was helpful and attentive, even going so far as having the pilot acknowledge a little girl’s birthday over the PA.
As my dad always says, it’s the little things a business can do that will keep people coming back, and will also keep people away. It’d be great if AC paid more attention to their customers as opposed to their bottom line. But that seems like wishful thinking. Anyway… Thanks for the thoughts Martin. Sorry for the long-winded response. Sorry to hear you had such a bad set of travel woes on AC. Thanks too for the heads up on the “buyer/traveler beware” & traveling with them further. I have to make some reservations to Italy for members of my family. AC is out, Alitalia is out, way too expensive … thinking of Luftansa. Thanks for your comments, Devorah and Daniel. In customer service, it’s the little things that count. I agree about the poor service. I traveled to New Zealand in January and had to take Air Canada to the west coast as usual, they are part of the same group of airlines as Air Canada. The contrast in service/quality between those two airlines was pretty evident (I find Air NZ is quite a good airline). I’ve come to expect poor service from Air Canada, although I’ve also found that most North American airlines are of pretty poor quality, e.g. they won’t give you a meal included with the price of the ticket even when the flight is five or six hours, if it’s within North America. I’m sure there is some ‘reason’ for that, but it seems unreasonable to me. Oops, I meant “Part of the same group of airlines as Air New Zealand”. It’s still to early for coherence! Thanks Melonie. It’s interesting how as consumers, we’re held hostage by certain brands. Sorry to hear about your Air Canada experience recently. I have heard enough stories over the years to just plain avoid booking on the airline whenever possible. I know your frustration because I too was bumped from my Air Canada flight to California and I had to wait two hours for the next flight. The only beneficial thing was that I received a $200 voucher.